Hugh Jackman’s full name is Hugh Michael Jackman. He was born on October 12, 1968 in Sydney, Australia. He is an Australian performer who is supposed to be a “triple threat” owing to his success as an actor, dancer and singer. He is best known for his action movies and stage musicals. Jackman enjoyed his childhood in Sydney. He made his acting debut at the age of five as King Arthur in a production of Camelot. He graduated from the University of Technology, Sydney in 1991. He was a student of communications there. Jackman had to pay for his classes and so he began working, doing temporary at the Actors Centre Australia. He was offered a role in the long-running television soap opera- Neighbours but rather chose to further improve his acting skills at the Western Australian Academy of Performing Arts located in suburban Perth. After his graduation completed in 1994, he got a role in the 10-part TV prison drama Correlli (1995). Jackman won the hearts of his fans through his role in it. He was cast as Kevin Jones who was an inmate who starts a dangerous flirtation with his psychologist (played by Deborra-Lee Furness). Jackman later married her co star Deborra-Lee Furness in 1996. That same year he worked as the lead actor in the Australian premiere of Andrew Lloyd Webber’s musical adaptation of Sunset Boulevard, a classic by Billy Wilder’s. That role led Jackman to London’s Royal National Theatre, where he bagged the role of Curly in Rodgers and Hammerstein’s Oklahoma in 1998. The ticket sales set records and made Jackman a renowned actor. Jackman made his film debut with the Hollywood movie X-Men in 2000. In the movie he was portrayed as a tortured anti hero Wolverine which gave him recognition in the industry and amongst his fans. He demonstrated his versatility by working in romantic comedies, Someone like You (2001) and Kate & Leopold (2001). In 2003 he once again worked in X2 playing once again the role of Wolverine. In 2003, Jackman made his Broadway debut in the biographical musical The Boy from Oz portraying as singer-songwriter Peter Allen. For American audience who were not familiar with his work in Oklahoma!, Jackman’s extravagantly spot-on performance was an exposure, and it won him a Tony Award in 2004. He further worked in A Steady Rain (2009) and The River (2014–15). He also hosted the Tony Awards show in 2003–05. By now Jackman was an established star in both Hollywood and on Broadway. He returned to the movies with the science-fiction romance The Fountain (2006), the thriller movie- The Prestige (2006) and X-Men: The Last Stand (2006). In 2008 he worked opposite Nicole Kidman in Baz Luhrmann’s Australia. Jackman’s performance was praised in the movie despite its mixed reviews. Later that year he revived his role as Wolverine in the X-Men Origins: Wolverine and then he was seen starring against Daniel Craig in the Broadway play A Steady Rain. Jackman has keen interest in sports like cricket, rugby and WWE. He has also been practicing transcendental meditation since the age of 20. He is also the brand ambassador of Indian mobile phone brand Micromax. 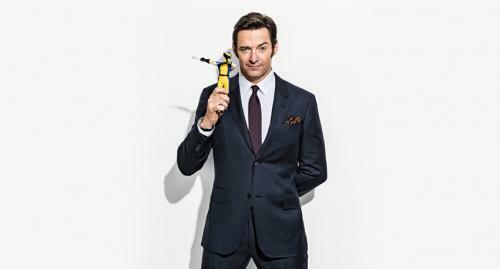 Jackman believes in charity and is a vocal supporter of Muhammad Yunus.